Thank you very much for the above mentioned vehicle which was received on 16/10/2013 . It was my 1st time to purchase a vehicle like this and people have had discouraged me not to order it but now when they saw the car their eyes are wide open now. More people are interested now. Enclosed photograph of the vehicle when taken out of the main wharf. thankyou guys, i recieved the car and it is perfect. how contact you soon for anather order. I have received my vehicle at the conditions exceeded my expectations. Dear employees of the Trust, greetings! Great happiness, so that grace the sea of anxiety and joy. On my behalf and on behalf of my family, my colleagues in the sector direct labor, my province of Tete, Mozambique and my country, will deposit quickly vote of confidence in the emancipation of the value and opportunities of international trade between the two countries Mozambique / Japan ... . Without further ado I would bet that a big challenge for next steps and opportunities of being an employee and agent of the trust company car in my province of Tete "in the land of coal from Africa," where there is large and large reserves of coal and iron. It is with great pleasure once again to inform you that i received the vehicle in very good condition. Thanks to you and the all Trust family for the good work you are doing in transforming many lives of people by selling very good vehicles. Japanese cars exporter company. I recomend it. My car is responding very well and came in good conditions. Good Morning! Just want you to know I love my car! Thank you! Remona B. Yes I'm very satisfy with the I bought from you. How are you. I would like to inform you that I received the Spacio yesterday Friday 27th. I love it. Thank you for a job well done, you were wonderful and everything you did made me trust your company more. It was that trust that made me encouraged my husband to buy the truck from your company. Thank you again Maki and all the best to you. I received my Toyota Vista car in a splendid condition. Thank you for your good service, i will definitely come back for another purchase. Thanks for your imail !i real apreciate your cooperation!I'm still enjoying Toyota Landcruiser Prado!my family like it so much!pass my warm greetings to all of you as team work! I am to imform you that. I received my Car TOYOTA MARK II GX 90 1995 and i am very happy this car, it is the best for me did not have a problems.Thanks for the receved..But missing JECK, AND SPANER. But not problems the Car i am enjoint.and good condition. I would like to confirm that I received the vehicle in good condition and I have driven it for the first 5,000km without incident. Thank you very much. THANK YOU VERY MUCH FOR SELLING ME A CAR THAT IS IN SUCH A TIPTOP CONDITION. WHEN I DECIDE TO BUY A VEHICLE I WILL DEFINITELY BUYB FROM TRUST COMPANY LTD.
Dear sir,iam so please with my bus that i had received you. a vehicle.,thank God almight.thank you . I am pleased to confirm that I received my vehicle, a RAV 4, in very good condition, on Sunday, 7th July, 2013. This is my second vehicle I have bought from your company, the first one was a Toyota Splinter bought in March, 2006 which was also in very good condition. 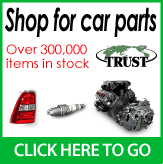 For good quality vehicles, TRUST COMPANY can always be trusted. I shall not hesitate to recommend anyone to procure a vehicle from your company. Please continue providing us with your good service. Find attached herewith, photos of the received vehicle for your confirmation. Find attached the car i imported from your company and myself. And permission is granted to use the said pictures on your website.